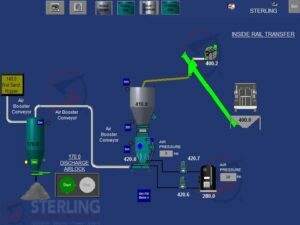 Recently Sterling Systems was asked to automate existing independent process equipment into a single automated system. 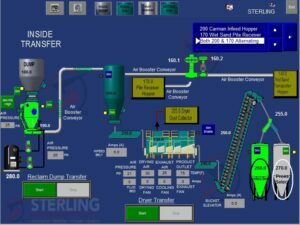 To do this Sterling Systems custom engineered two (2) UL Approved Control Panels for Wet Sand Processing. The facility processed wet sand into dry sand for use in the masonry industry. Two UL Approved Controls Panels were supplied for use in two different locations, one outside and one inside. The outdoor control panel, in addition to acting as an HMI also integrated the controls for outside equipment and access to this equipment from the PLC (inside control panel) was via Ethernet. 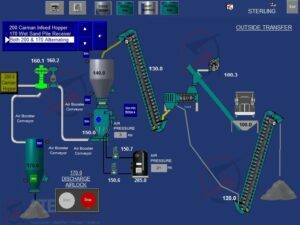 The automated process control system is designed to control and monitor various equipment for moving wet sand from either rail car or reclaim dump hopper. Pneumatic dense phase conveying pressure pots are used to transport the wet send to the Infeed hopper and then conveyed through a dryer and finally stored in two sand silos. Wet sand from the outside can also be transported via pressure pot to a wet sand pile receiver hopper. The inside reclaim dump process displays the equipment used in the process. The status of each piece of equipment is indicated on the screen by color. The color will change depending on whether the equipment is in Manual, Automatic or Off. The outside rail screen graphically displays the equipment used in the receiving and discharging process. The status of each piece of equipment is indicated on the screen by color. The color will change depending on whether the equipment is in Manual, Automatic or Off. The inside rail reclaim dump screen graphically displays the equipment used in the receiving and discharging process. The status of each piece of equipment is indicated on the screen by color. The color will change depending on whether the equipment is in Manual, Automatic or Off. The Dust Hoppers screen graphically displays the equipment used. The status of each piece of equipment is indicated on the screen by color. The color will change depending on whether the equipment is in Manual, Automatic or Off. This automated system is designed to control and monitor various equipment for moving wet sand from either rail car or reclaim dump hopper. Dense phase pneumatic conveying pressure pots exist and are used to transport the wet send to an Infeed hopper then conveyed through a dryer and finally stored in two sand silos. Wet sand from the outside can also be transported via pressure pot to a wet sand pile receiver hopper. NEMA12/4 mild steel Main PLC Panel. This panel encloses the main Allen Bradley PLC rack for controlling and monitor equipment located inside the facility. This control panel also includes an Allen Bradley PanelView+ 1000 touchscreen display. NEMA12/4 mild steel Rail Car Panel. This panel houses a remote I/O PLC rack for controlling and monitoring equipment located outside the building. The panel also includes an Allen Bradley PanelView+ 1000 touchscreen display. Ethernet connection exists between the two Control Panels. Two wall mounted alarm/light beacons located outside and inside near the Sterling Systems supplied control panels. One outside mounted traffic light located near the reclaim dump hopper for communicating to the operator of the end loader. The Allen Bradley PanelView+ located on the main PLC control panel and on the Rail Car Panel each contain several screens. These screens are for equipment inside the building from the reclaim dump hopper to the dryer and two (2) sand silos. Each equipment item on the screens that are automated can be tapped on to open the manual/off/automatic popup screen. Typically all equipment will be in automatic. The manual or off selections will be used for troubleshooting or testing only. However if any of the equipment is manually controlled, it will override any process interlocks. If equipment are left in automatic, all interlocks will be observed. Amperage from any motor that may have a VFD will be shown on the PanelView+ display. Temperatures from the dryer will also be shown. Pressures from either of the system pressure pots will also be shown. A System Parameter screen exists and contains fields to hold various timers such as equipment purge, spin-up, and fault timers. 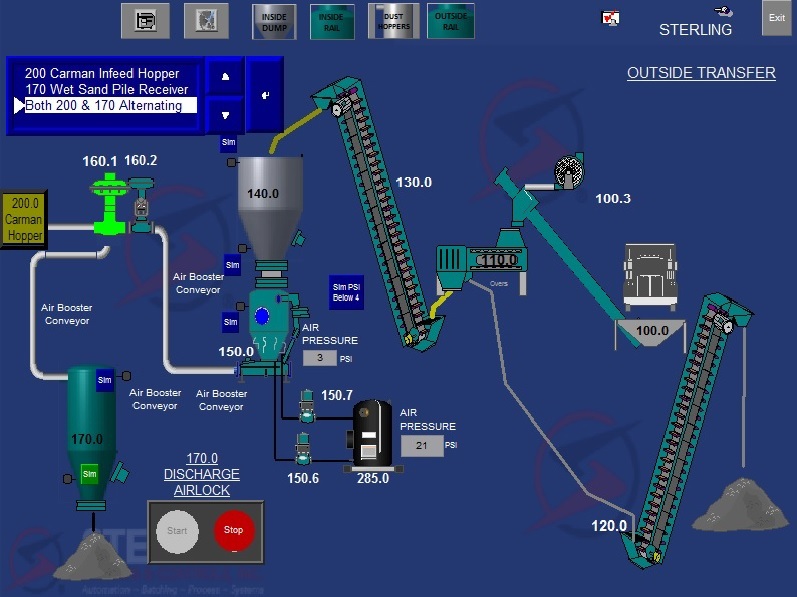 The process screen showing equipment states is graphical in nature and logical in flow. Either equipment graphics or symbolic icons are used to distinguish equipment operating states indicating whether equipment is running, stopped, or faulted. Security is implemented to make any screen inaccessible when not logged in. When the PanelView remains idle, the operator is automatically logged out. An Alarm Banner and History is available. The Alarm History holds up to 200 alarms. 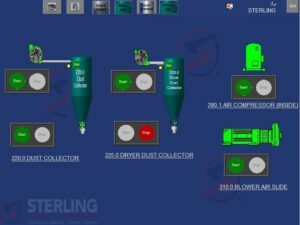 In addition to the equipment process screens on the Sterling Systems supplied PanelView HMI’s, the PanelViews also integrate screens for and including the dense phase pneumatic conveying pressure pots. For more information about this system or for a review of a custom engineered system proposal give us a call to speak with one of our senior technical sales engineers today at 815-625-0852 or email at sci@sterlingcontrols.com.